Pauleen, David, David Rooney and Ali Intezari. “Big Data, Little Wisdom: Trouble Brewing? Ethical Implications for the Information Systems Discipline.” Social Epistemology Review and Reply Collective 4, no. 8 (2015): 9-33. How can wisdom and its inherent drive for integration help information systems in the development of practices for responsibly and ethically managing big data, ubiquitous information, and algorithmic knowledge—particularly in their collection, integration, analysis, presentation, and use—and so make the world a better place? We use the recent financial crises to illustrate the perils of an overreliance on and misuse of data, information, and predictive knowledge when global IS are not wisely integrated. Our analysis shows that the global financial crisis was in part caused by a serious lack of integration of information with the larger context of social, cultural, economic, and political dynamics. Integration of all the variables in a global and information hungry industry is exceptionally difficult, and so ‘exceptionality’ of some kind is needed to make sufficient integration happen. Wisdom, we suggest, is the exceptionality needed to lead successful integration. We expect that a wisdom-based shift can lead to more organisationally effective and socially responsible IS. The use of Information Systems (IS) has evolved from discrete business and government based support systems in the 1960-80’s to broad, integrated systems that reach into every aspect of individual and social life. Recent and dramatic advances and emergent trends in technologies, such as the Internet and mobile technologies, have raised many new, vital and interesting questions and dilemmas for the IS field such as: are modern technologies beneficial or problematic for the well-being of individuals, organizations, and societies at large? How can organizations, governments, individuals and societies manage the use of technologies wisely? What are responsible roles for IS practitioners and academics in developing, managing, researching, and teaching about new technologies? It is important to ask such questions that can yield significant insights, increase awareness of the issues, deepen the dialogue and help redesign what is increasingly a technology-driven future. According to Geoff Walsham, a senor IS academic, the world that IS inhabits today is very different to the world it served a quarter of a century ago (Walsham 2012). The world and the impact of technology have both changed so dramatically in the three decades since IS became a recognised discipline that business as usual is no longer good enough if IS is to contribute to creating a better world (Walsham 2012). Walsham (2012) sketches out a ‘skeleton’ agenda, which includes ethical goals and critical approaches, and asks the fundamental question, is IS making the world a better place and if not, what needs to change? We build on Walsham’s provocative ‘skeleton’ with a similarly provocative and critical question to ask whether wisdom and its capacity for integration can create sufficient understanding and impetus to harness the intelligence of IS to make the world a better place. We show why wisdom matters to IS in a world that is both blessed and cursed with big data, ubiquitous information, and analytically powerful predictive (algorithmic) knowledge. To make a case for the special responsibilities of IS in the world today, we will use the case of the global financial crisis (GFC) to show that the GFC was impelled in no small measure by lack of integration of information (and data and knowledge) with the larger context of social, cultural, economic, and political dynamics. Looked at this way, the GFC is an exemplar of the deficits in IS that Walsham is concerned about. Lack of integration led not only to dysfunction and an inability or unwillingness to understand consequences, but to unwise behaviour. Our data shows that unwise information behaviours were widespread in the financial sector and contributed to the financial crises that have spread globally since 2007. The point we emphasise is that integration of all the variables in a global and information hungry industry is desirable but exceptionally difficult, if not impossible, and so exceptionality of some kind is needed to at least make realistic efforts at working towards integration. Wisdom, we argue, is the exceptionality necessary to create integration of this sort in IS. For this article wisdom is defined as the integration of appropriate (1) qualities of mind, (2) excellent knowledge, predispositions, and transcendence, (3) virtue, (4) the ability to do what must be done in a specific situation, and (5) to create long and short term well being and flourishing (Rooney 2013a, b). Data, information, and knowledge are important factors for achieving success in the business world (Holcombe 2013). However, without considering social, cultural, and political contexts the effectiveness of relying solely on ever-increasing amounts of data and information is doubtful. In a study of business executives whose contributions to society have been positively influential, Mayo and Nohira (2005) conclude that the leaders all have ‘contextual intelligence’, a profound ability to make sense of and understand the zeitgeist of one’s time to build successful organisations and fair societies. Promoting wise leadership in IS is a viable starting point for change. Economic, social, cultural, and political contexts are interrelated (Marglin 2008), and understanding these contexts and their interwoven nature is critical in the effective use of data, information, and knowledge. Norgaard (1995) argues that values, knowledge, technology, the environment, and social organisation evolve through a co-evolutionary process. Therefore, some argue that a nuanced dialectical relationship between managers’ social, environmental and economic views is required for the survival and development of businesses (Molteni and Pedrini 2010). Sawyer et al. (2011) argue that IS research must consider wider cultural and social contexts in which data, information, technology, and IS are developed, combined, and implemented. From a systems perspective wisdom may be understood as a kind of systems intelligence, which draws on extended notions of intelligence combined with the structure of systems thinking with the objective of functioning “successfully within the complex world of continually emergent systems” (Jones et al. 2011, 83). Similarly, wisdom acknowledges and balances economic, social, organisational and individual concerns and shows the pathways towards a good life for all (Sternberg 1998). Wisdom is commonly understood to be associated with knowledge, judgment, ethical and social intelligence, interpersonal skills, decision-making, and action (Rowley and Slack 2009; Gibson 2008; Kramer,1990), and most of these constructs are found in wisdom theory (see Sternberg 1998; Staudinger and Pasupathi 2003; Brown and Greene 2006; Staudinger 2008; Yang 2008; Ardelt 2009; Yang 2011). The paper is structured as follows. In the first section, the current state of research concerning the relationship between business, wisdom, ethics and IS is introduced as well as the research question that guides this paper. Wisdom is discussed and defined from a multi-disciplinary perspective and its relationship to information and knowledge is detailed. Then the Global Financial Crisis is analyzed as a meta- (involving multiple companies, industry-wide practices, and regulatory agencies) case study to illustrate the perils of unwise use of data, information, and predictive (algorithmic) knowledge in a complex context. In further discussion, we argue for the integrating role of wisdom. The paper concludes with a discussion of the implications of a wisdom shift for IS research and practice. Managing information and information systems becomes more difficult as IS become more ubiquitous and business seeks better integration globally. While most academic wisdom related research has been in the areas of psychology and more recently management, there has been some wisdom-related research from an information systems perspective. Recent publications indicate a developing interest in wisdom in relation to knowledge management (Intezari and Pauleen 2012), wisdom computing (Dalal 2008), and discussions around the role of information in the good life (Spence 2011). Mansell (2010), in a review of Information Society research, proposes drawing on the classical philosophers, such as Aristotle, to understand how practical wisdom can foster humanistic applications of information, knowledge, and learning. A core element of wisdom is ethics; for example, Davison and Drummond (2009) emphasise accountability and ethical integrity of IT professionals, and after investigating the applicability of Kohlberg’s theory of Cognitive Moral Development conclude that ethics awareness programs must be implemented at the organisational level. Schwartz and Sharpe (2010) also emphasized the centrality of moral skill in wise professional practice and practical wisdom. Mason (1986) identified four major ethical issues of the information age that threaten human dignity: privacy, accuracy, property, and accessibility. These issues continue to concern us in the aftermath of the GFC. Mason argued that we must ensure that information and information systems are used towards the enhancement of human dignity. This commitment, we suggest, is still required. Data, information and knowledge are fundamental elements of IS. Researchers have been exploring the data, information, knowledge hierarchy model for some time and more recently have considered the role of wisdom (DIKW) in this modelling (Bierly et al. 2000; Rowley 2007; Vandergriff 2008; Liew 2013). For the most part these papers critique the linear- hierarchical representation of data, information and knowledge and offer reinterpretations that put a greater emphasis on wisdom or intelligence. For example, Intezari and Pauleen (2014) consider DIK as a necessary foundation for the development of wisdom, and argue that along with knowledge, wisdom engages other qualities like awareness, emotions, reflection, judgment, intuition, and ethics. Similarly, Bierly et al. (2000) emphasizes the need for considering ‘wisdom’ in knowledge-based theory of the firm, and argue that wisdom must be transferred throughout an organization. They associate different learning processes with each level of the DIKW model: ‘accumulating truths’ with data, ‘giving form and functionality’ with information, ‘analysis and synthesis’ with knowledge, and ‘discerning judgments and taking appropriate action’ with wisdom. The question we pose in this paper is: How can wisdom and its inherent drive for integration help IS in the development of practices for responsibly and ethically managing big data, ubiquitous information, and algorithmic knowledge—particularly in their collection, integration, analysis, presentation, and use—and so make the world a better place? Although originally rooted in philosophical and spiritual discourse, wisdom has re-emerged in contemporary academic literature in a number of areas, including psychology, management, and cross-cultural and gender studies. In psychology wisdom tends to be understood as knowledge. Baltes and his colleagues (Baltes and Staudinger 2000; Baltes and Kunzmann 2003; Baltes 2004) believe that wisdom is a form of expert knowledge. Sternberg (Sternberg 1990; Sternberg 2003), in his Balance theory of wisdom, sees wisdom as rooted in implicit knowledge. In addition to psychology, wisdom is now researched in organisational and management studies (Gibson 2008; Rooney et al. 2010). A richer picture of wisdom is presented in this literature, which is usually interdisciplinary. In this literature, wisdom engages judgment (Intezari and Pauleen 2013), and harmonises knowledge, action (Gygax and Fitzgerald 2011), awareness (Kramer 1990), and ethics (Schwartz and Sharpe 2010). Traditional and indigenous systems also show the importance of wisdom in management; for example, Spiller et al (2011) demonstrate how the approach of relational wisdom informed by the ethic of kaitiakitanga (stewardship) of indigenous Māori can reframe the prevailing economic argument that sees companies profit and prosper at the expense of communities and ecologies. McDonald’s (2011) analysis of Chinese businesses reveals that practical wisdom, as proposed by Chinese classical traditions, such as Confucianism has been instrumental in the practices of modern Chinese business leaders. Opdebeeck and Habisch (2011) argue that compassion as a trans-cultural interpretation of wisdom would be beneficial for management development, international strategy courses, and cultural management. Although distinctions exist in cultural conceptions of wisdom, there is also a significant degree of concurrence around ethics, pro-social behaviour, the importance of transcendent abilities (creativity, imagination, insight, etc. ), knowledge, learning, and integration (Curnow 2011). 1. Qualities of mind: An aware, equanimous, and actively open mind. This involves equanimity and dispositions for openness to new ideas, experiences, and critique, and the ability to mindfully, adroitly, and constructively reason (including both logical and transcendent—insight, foresight, mindsight, imagination, and creativity—faculties) and understand uncertainty and any situated relativities of values, culture, and politics. 2. Knowledge and intuition: Self-knowledge, social, cultural, economic and political knowledge, and insight to achieve social excellence and to create well-being. 3. Virtue: Empathy and pro-social behaviour. This involves moral skill and empathetic and careful consideration and understanding of others’ needs, including emotional and social needs, to find the right and ethical (virtuous) thing to do. 4. Praxis/doing: Courage, generosity, and prudence in responsible use of knowledge and power. This involves knowing why, how, and when to adapt to the environment and why, how, and when to change the environment, including having the mastery, judgment, and courage to do so in specific circumstances. 5. Creating positive and sustainable outcomes for genuinely positive long-term change to the conditions of life: This involves being a galvanising leader and artful communicator. Doing this requires an aesthetic, forward-looking, constructive, and positive way of living as a skilled and ethical communicator, clear, insightful, and transcendent thinker, and humble person. These SPW principles are not to be confused with a narrowly defined wisdom theory or model, as wisdom research is not yet in a position to claim it has created a formal, measurable construct; wisdom remains a mutable concept (Glück et al. 2013; Bangen et al. 2013). SPW principles are based on an exhaustive review of literature (Rooney et al. 2010; Rooney 2013a, b), and are for use by researchers and professionals along with their judgment and discretion about how and when to use them (Hirschheim and Klein 1994; Rooney et al. 2010; Hirschheim and Myer 2011). IS has evolved both technologically and conceptually as it seeks to tackle issues such as geometrically increasing amounts of data and information and the environmental dynamics that influence current business contexts, particularly in areas such as risk analysis and business intelligence and analytics (Hu et al. 2012). However, we suggest these are not enough and what is needed to fill the gaps in IS is wisdom. We argue that information, along with big data has become not just ubiquitous, but a resource that can be used and misused by those who specialise in the collection of information and who provide analytical and predictive services such as those provided in financial services industries. And yet an overwhelming and incautious reliance on data, information, and knowledge can cause significant negative consequences, as we shall argue was the case in the recent financial crises. We suggest a wisdom-based approach can address these challenges. Let us explore further why information, knowledge, and intelligence on their own are not enough. In doing this we draw on a critical research and practitioner literature to bring the challenges of a post GFC world into sharper focus. Historical data is a building block for knowledge and is used to create predictive (algorithmic) knowledge. Predictive knowledge is criticised because: “Judgment and incentive, therefore, are rendered explicitly in quantitative terms” to “manufacture the simulation of security” (Danisch 2011), robbing people of the opportunity to exercise and develop common sense, practical wisdom (cf. Schwartz and Sharpe 2010; Danisch 2011), and resilience in the face of ambiguity and uncertainty. Caution is urged when it comes to the management of big data as utilizing big data will involve new ways of deciding and managing (Davenport 2013). IS may be helping to diminish wisdom, resilience, and common sense. Business intelligence is now focussing on big data. Chen et al. (2012) define business intelligence and analytics (BI&A) as “the techniques, technologies, systems, practices, methodologies, and applications that analyze critical business data to help an enterprise better understand its business and market, and make timely business decisions” (1166). These authors trace the evolution of BI&A 1.0 (databases), BI&A 2.0 (Internet-based data) through to BI&A 3.0 (data from mobile phones, tablets, etc.). The “big impact” from these huge amounts of data is the “new science, discovery and insights … obtained from the highly detailed, contextualized and rich contents of relevance to any business or organization” (1168). The reach and impact of BI&A lends itself to greatly influencing areas as diverse as e-commerce, market intelligence, e-government, science and technology, health and wellbeing, and security and public safety (Chen et al. 2012). Big data analytics, data mining and analysis, now include text, Web, network, and mobile analytics. The reach of big data and analytic knowledge is impressive and pervasive. The counter punch to the ‘big data, big impact’ argument, however, as Pape and Kok (2011) have reasoned in a discussion on algorithmic intelligence, is that the assumption that the world can be fully formalized is invalid (Pape and Kok 2011) and, therefore, the world is not computable. In this study we map and analyse the semantic structures surrounding the concept, information, to explore information as a cause of the recent financial crises. Our dataset is The Financial Crises Inquiry Report: Final Report of the National Commission on the causes of the financial and economic crises in the United States (2011) (henceforth, the Report), which provides 662 pages of findings. The Financial Crisis Commission’s (the Commission) inquiry was set up by the US Government to find and analyse the causes of the financial crisis. The Report provides a comprehensive set of findings provided by the Commission based on the evidence. Our textual analysis of the Report shows that the Commission found that failures related to information were material to the crisis. While the GFC case is not exclusively an IS case, it does highlight the overwhelming and ever-increasing role of information systems in business and society. That the case points out many of the consequences of an over reliance on data and information and integration deficiencies helps us to understand the ways in which the use of IS may be improved and to address the question guiding this research of how can wisdom help IS make the world a better place? 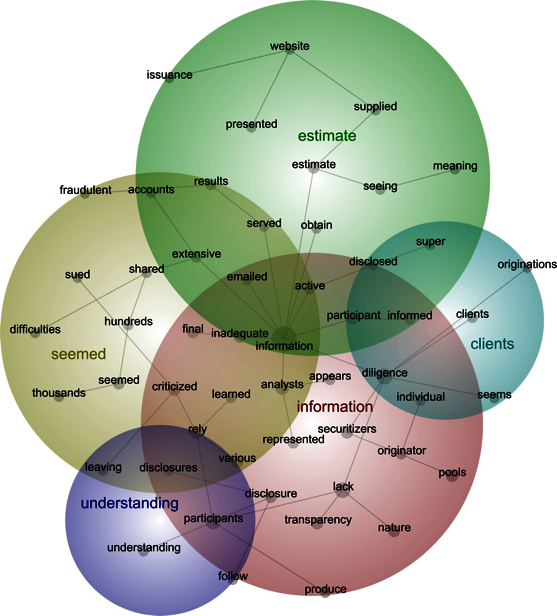 Computer aided text analysis allows researchers to create concept or semantic maps (Kuhn and Corman 2003) that, for example, link knowledge to practice (Rooney 2005; Rooney et al. 2011), opening up new analytical possibilities for text analysis. This study uses Leximancer text analysis software. Leximancer has been used for data and knowledge engineering research (Davies et al. 2006), information society research (Rooney 2005), researching the role of knowledge in organisational change (Rooney et al. 2009), and intelligent information systems research (Watson et al. 2005). Leximancer has particular value when large data sets are being analysed because of its ability to reliably model the semantic structure of a whole data set, regardless of its size. In this study, because we are primarily interested in information-related problems in the Report, Leximancer is invaluable because of its ability to model (or profile) the semantic structures around the concept, information, in the data set. Leximancer uses data mining, machine learning, and stochastic analysis techniques to identify and map statistically significant themes and concepts (Smith and Humphreys 2006). Leximancer examines proximity of words to each other in texts by building a word co-occurrence matrix. It then distinguishes between themes, concepts, and words, with concepts being the most semantically significant words, and themes being sets of clustered, highly semantically related concepts. In our analysis ‘themes’ are written within inverted commas and concepts are written in italics. Words are used in analysis by investigating the thesaurus of words that Leximancer creates for each concept. A concept’s thesaurus words are words that frequently co-occur with a concept. For example, the words bone, cat, and kennel might frequently co-occur with the concept, dog, and therefore make up part of that concept’s thesaurus. Strength of links between concepts is established by measuring the frequency with which a concept co-occurs with another concept. Leximancer maps allow researchers to see the semantic structure and relational architecture of important concepts and themes in the data. Researchers can use the map to form hypotheses that can be tested by, for example, doing hermeneutic or discourse analysis of concepts in the text. Therefore, researchers can interrogate the text and interpret it in light of their knowledge and understanding of the data. The finance and banking sector is data and information driven, and well advised to use advanced data modelling techniques and economic analysis. However, testimony to the Commission makes it clear that the reality of working with and managing information in the finance sector is not simple. The Commission’s report was written to focus on problems that contributed to the financial crisis in the US and in doing this found significant problems linked to information. We focus on the three largest themes on the concept map; the ‘estimate’ theme at the top of the map, the ‘seemed’ theme on the left side, and the ‘information’ theme at the bottom right. The ‘estimate’ theme is comprised of a number of important concepts, including meaning, seeing, disclosed, and estimate. The ‘seemed’ theme contains important concepts such as fraudulent, sued, difficulties, criticised, and inadequate. The ‘information’ theme contains important concepts such as analysts, diligence, appears, lack, transparency, disclosure, represented and shares significant concepts with the ‘seemed’ theme such as criticised, inadequate, learned, and rely. The concept information sits at the centre of the map and within the overlapping space between the three main themes. At face value, the concept map shows information is linked to illegal and otherwise undesirable activities, to lack of transparency and lack of understanding, even alluding to ignorance and foolishness, as well as issues around diligence. There is also the suggestion of deception through problems around lack of disclosure. The map strongly suggests of a lack of wisdom, e.g., lack of ethics, lack of empathy, lack of social intelligence, lack of open mindedness, poor information, knowledge and judgment, and poor practice and outcomes, all of which run counter to SPW principles. To investigate these issues we now look more deeply into the report’s text. Our analysis now examines further the roles of information problems, indiscipline and dishonest practices, and problems with knowledge and judgment that led to unwise or unethical behaviour and seriously problematic outcomes. It is somewhat surprising that although the report notes “The mortgage market is studied constantly by thousands of analysts, academics, regulators, traders and investors” it also says that: “It appears that market participants were unprepared for the destructiveness of this bubble’s collapse because of a chronic lack of information about the composition of the mortgage market” (465). A consistent theme in the report is problems caused by lack of information. “There are at least three contributors to lack of information. Shortcomings in transparency, lack of reporting requirements, and limited data collection by third parties make it difficult to document and describe the various market trading problems that emerged during the crisis” (621). While the Office of the Comptroller of the Currency did report information on derivatives positions from commercial banks and bank holding companies, it did not collect such information from the large investment banks and insurance companies like AIG, which were also major OTC derivatives dealers. During the crisis the lack of such basic information created heightened uncertainty (299). Adequate information about the risks in this market was not available to market participants or government regulators like the Federal Reserve. Because the market had been deregulated by statute in 2000, market participants were not subject to reporting or disclosure requirements and no government agency had oversight responsibility (299). Structural obstacles to collecting and integrating information clearly existed and important regulators were not entitled to collect critical information from business. At the very least, information and IS management between financial organizations appears to need improvements to enhance integration. 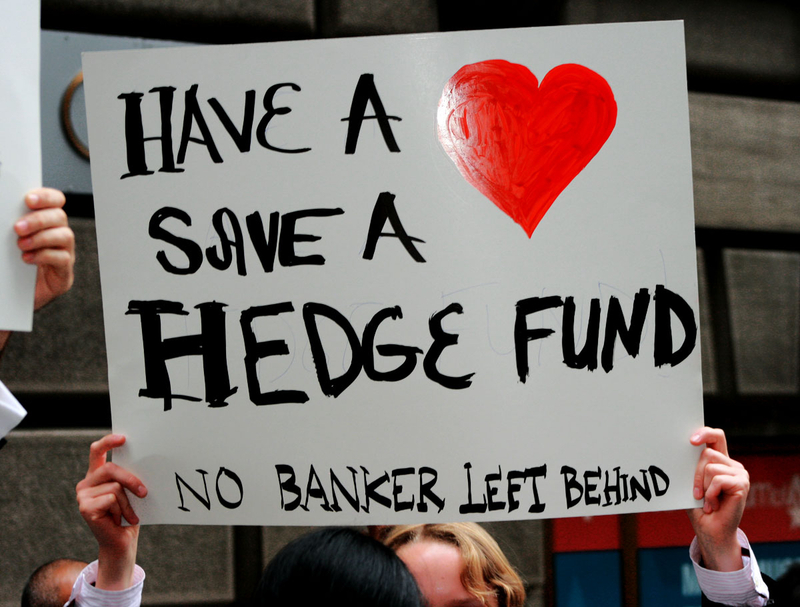 Some members were concerned about the lack of transparency around hedge funds, the consequent lack of market discipline on valuations of hedge fund holdings, and the fact that the Federal Reserve could not systematically collect information from hedge funds because they were outside its jurisdiction (241). Mendacious activity is also associated with information use in our data. Goldman has been criticized—and sued—for selling its subprime mortgage securities to clients while simultaneously betting against those securities. Sylvain Raynes, a structured finance expert at R&R Consulting in New York, reportedly called Goldman’s practice “the most cynical use of credit information that I have ever seen,” and compared it to “buying fire insurance on someone else’s house and then committing arson” (236). This lack of communication was remedied only by a formal memorandum of understanding (MOU) to govern information sharing. According to former SEC Chairman Christopher Cox, “One reason the MOU was needed was that the Fed was reluctant to share supervisory information with the SEC, out of concern that the investment banks would not be forthcoming with information if they thought they would be referred to the SEC for enforcement” (298). Due diligence is an important part of commercial life and assists building and maintaining trust and integrity, but it requires valid and reliable information to assess integrity. Due diligence is about being responsibly informed and knowledgeable in commercial activity. The ratings agency, Moody’s, was dysfunctional as a key institution in the process of due diligence in the financial industry. Information Moody’s fed into decision making was unreliable. The SEC criticized Moody’s for, among other things, failing to verify the accuracy of mortgage information, leaving that work to due diligence firms and other parties; failing to retain documentation about how most deals were rated; allowing ratings quality to be compromised by the complexity of CDO deals (211). Participants in the securitization industry realized that they needed to secure favorable credit ratings in order to sell structured products to investors. Investment banks therefore paid handsome fees to the rating agencies to obtain the desired ratings (44). The failures of ethical conduct, of transparency (openness), and positive dispositions are all apparent here. Each of these failures violated SPW principles and suggests that information management practices were inadequate for the protection of consumers. The size and complexity of the finance industry is also identified as a problem. The Report shows that some assumed that scale was not a problem because technology was so advanced that it could sustain ever-greater operational challenges. By the mid-1990s, the parallel banking system was booming, some of the largest commercial banks appeared increasingly like the large investment banks, and all of them were becoming larger, more complex, and more active in securitization. Some academics and industry analysts argued that advances in data processing, telecommunications, and information services created economies of scale and scope in finance and thereby justified ever-larger financial institutions (52). Invulnerability, whereby they believe that they will get away with whatever they do, no matter how inappropriate or irresponsible it may be. These states of mind do not encompass the equanimity and mindset that SPW requires and do not create the dispositions for pro-sociality, empathy, and ethicality that wise praxis depends on. Just as it was for data and information, problems around a lack of knowledge were also raised in the Commission’s report, a sentiment echoed by University of Iowa law professor Katherine Porter, an expert in foreclosures. She states: “It is lack of knowledge of how widespread the problems may be that is turning the allegations into a crisis. Lack of knowledge feeds speculation and worst-case scenarios” (408). Perhaps even worse than this lack of knowledge was the foolish temptation to pretend to know and blatant ignorance. For example, lenders have relied on “robo-signers” who substituted speed for accuracy by signing, and sometimes backdating, hundreds of affidavits claiming personal knowledge of facts about mortgages that they did not actually know to be true (407). Knowledge might be power but in the hands of fools it is not necessarily power used for ethical purposes. No amount of knowledge on its own is a substitute for wisdom because knowledge without judgment and foresight is the province of the fool. Equally problematic are the mathematical models and their fallible users we noted earlier in this article. Financial institutions and credit rating agencies embraced mathematical models as reliable predictors of risks, replacing judgment in too many instances. Too often, risk management became risk justification (xix). Professional judgments about what models can do and how reliable they are at predicting the future are raised in this quote. A serious lack of judgment was therefore evident throughout the financial industry. A blind reliance on the information and analysis provided by credit ratings agencies and the public stewards (that were not always objective) is evidence of an inability to think independently and critically. Even having the knowledge that some securities were suspect was not enough. Financial institutions made, bought, and sold mortgage securities they never examined, did not care to examine, or knew to be defective; … and major firms and investors blindly relied on credit rating agencies as their arbiters of risk (xvii). Quants and mathematical models replaced “judgment in too many instances” (xix). The tendency to replace independent thinking and sound judgment with mechanistic modelling was unwise. No modelling can ever be assumed to accurately and automatically predict the future and no ethical statistician would present the results of modelling without relevant caveats about reliability and confidence. At the moment, mathematical models are devoid of almost all the elements of SPW. A worse situation is using modelling to justifying taking unacceptable risks rather than protecting investors from reckless risk taking behaviour. Shaky loans had been bundled into investment products in ways that seemed to give investors the best of both worlds—high-yield, risk-free—but instead, in many cases, would prove to be high risk and yield-free. All this financial creativity was a lot “like cheap sangria,” said Michael Mayo, a managing director and financial services analyst at Calyon Securities (USA) Inc. “A lot of cheap ingredients repackaged to sell at a premium,” he told the Commission. We have already noted the adverse effects of lack of information on market discipline but there is also a more specific problem related to underwriting standards. The mortgage market is studied constantly by thousands of analysts, academics, regulators, traders and investors. How could all these people have missed something as important as the actual number of NTMs [non-traditional mortgages] outstanding? Most market participants appear to have assumed in the bubble years that Fannie and Freddie continued to adhere to the same conservative underwriting policies they had previously pursued (466). The question in this excerpt is a rhetorical one. No amount of analysis can reliably inform those who do not want to be informed and no amount of information produced through inappropriate risk analysis frameworks (underwriting standards) is helpful. Aristotle would regard such behaviour as reckless and as symptomatic of poor character (Hutchinson 1986; Hughes 2001). Reckless underwriting standards are not necessarily improved by sophisticated information systems, and in this case such systems were identified as part of the problem. As private-label securitization began to take hold, new computer and modelling technologies were reshaping the mortgage market. In the mid- 1990s, standardized data with loan-level information on mortgage performance became more widely available … The days of laborious, slow, and manual underwriting of individual mortgage applicants were over, lowering cost and broadening access to mortgages (72). Lowering the cost of underwriting is a reasonable goal but it is imprudent to assume that lowering underwriting costs will not erode standards. If prudence is important, and it surely is, then wisdom should also matter. If wisdom could be increased in the IS-dependent finance industry it could make a significant difference because our data points to seriously unwise and unintegrated activity around information, knowledge, and MIS. 4. Lack of intellectual integrity, foolishness, and failure to exercise judgment. Each of these issues in some way concerns the management of information. Table 1 links these issues with information management and indicates how SPW could be applied for greater management awareness and effectiveness and for the design and use of Information systems. Scale and complexity of industry, regulatory, and market information and information needs Information systems (decision support, executive systems) that provide more parameters for information analysis. 1. Qualities of mind: dispositions for new ideas, experiences and critique to mindfully and constructively reason …to understand uncertainty and situated relativities. Lack of intellectual integrity, foolishness, and failure to exercise judgment Information systems (decision support systems, executive systems) that provide more parameters for information analysis (ethical DSS, etc). 1. Qualities of mind: dispositions for new ideas, experiences and critique to mindfully and constructively reason …to understand uncertainty and situated relativities. 1. Qualities of mind: An aware, equanimous, and actively open mind. 3. Virtue: Empathy and pro-social behaviour. 4. Praxis/doing: Courage, generosity, and prudence in responsible use of knowledge and power. 5. Creating positive and sustainable outcomes for genuinely positive long-term change to the conditions of life. The issues we identify are inextricably linked to a breakdown in management and leadership qualities, where prudence, judgment, insight, and virtue, which are required to use information and knowledge responsibly, were lacking. There was also a failure of ignorance as the Report points out: “The captains of finance and the public stewards of our financial system ignored warnings and failed to question, understand, and manage evolving risks” (xvii). This assessment suggests that ignorance and foolishness, the antithesis of wisdom (and hopefully MIS), prevailed. One of the main, and arguably most damning, findings of the Report is that “there was a systemic breakdown in accountability and ethics” (xxii): an ethos of irresponsibility, recklessness, and negligence. Ethics and ethical behaviour are fundamental aspects of wisdom and no matter how successful an idea is, if it is not ethical it is not wise. Even more vexing is a form of peer pressure in the market that led to bad information use becoming standard practice, raising troubling questions about the collective foolishness embedded in the culture of organisations and the lack of strength of character of information management and leadership. Gramlich noted again the “increasing reports of abusive, unethical and in some cases, illegal, lending practices.” Bair told the Commission that this was when “really poorly underwritten loans, the payment shock loans” were beginning to proliferate, placing “pressure” on traditional banks to follow suit (11). This culture forms a large part of the context that influenced how data and information were understood and how knowledge was applied. In an environment like this, monitoring and decision making suffer. Numerous examples of naïve information and risk management and poor leadership are reported in the Inquiry Report. The following quote is representative: “In retrospect, Citigroup had two key problems: a lack of effective enterprise-wide management to monitor and control risks and a lack of proper infrastructure and internal controls with respect to the creation of CDOs” (303). The combination of naïve management and poor leadership led to an inability to deal with complexity and had wide-ranging negative effects. These included a significant fall in market confidence, which had “eliminated the ability to raise capital” (319), and that the Federal Housing Finance Agency, for its part, “lost confidence in the Board of Directors and the executive management team” (319), holding them accountable for losses stemming from “a series of ill-advised and poorly executed decisions and other serious misjudgments” (319). Poor decision-making, misjudgements, and poor execution erode confidence and trust. Ultimately, loss of confidence and trust had powerful global effects as banks ceased lending to each other because they could not trust each other. More basic is the following critique of the role of arrogance in foolishness. In that special examination, OFHEO pinned many of the GSEs’ problems on their corporate cultures. Its May special examination report on Fannie Mae detailed the “arrogant and unethical corporate culture where Fannie Mae employees manipulated accounting and earnings to trigger bonuses for senior executives” (180). Arrogance and an unethical ethos leading to manipulative, selfish, and even hubristic and greedy behaviour are brought to the foreground here. This is foolishness writ large. Accountants are central users and creators of data, information, and knowledge. Unethical cultures seem to have flourished throughout the financial industry before and during the GFC. It seemed to have become normative behaviour. At the risk of sounding naïve, we wonder how corporate leaders and managers can so completely lose their moral compass and recklessly use information to bring disaster to so many. A wisdom-based approach to leadership, and managing data, information and knowledge would help to prevent the foolishness that seemed central to the actions of all parties in this financial fiasco. But what would this look like for IS; what role can IS play as a provider of wise leadership to their organizations and the wider community? While the advisory professions (consultant, analysts, etc.) seek to understand the future and offer hope of solutions, these professions are less than perfect and are capable of human error, technical limitations, incompetence, manipulation, and malfeasance. This means all of us must be prepared to be critically engaged, insightful—even prescient—and to act responsibly, prudentially, and wisely. We believe that IS researchers and practitioners, as the progenitors of information and data systems, have a special responsibility to think and act wisely and suggest that MIS lead the way by re-visioning the role of information management and information systems by incorporating social and cognitive elements of wisdom in their practices and systems designs. We believe that a difference between merely talented or intelligent business leaders and those who excel through wisdom is connected to how they view and use data, information, and knowledge, and their attention to building skills in judgment, ethical decision making, and developing openness to new ideas. In practical terms this manifests in wise people who then use cohesiveness and coherence of their knowledge from experience, as well as empathy, insight, creativity, and judgment in management practice. We suggest that the capacity to integrate well across multiple dimensions is important in an unpredictable world and is inextricably linked to wisdom. Wisdom needs abstract as well as situation specific knowledge to be integrated with the contexts managers face in a particular time and place. Generalised, impersonal knowledge, information, and data therefore are certainly not anathema to wisdom, but they should be integrated and informed by empathy and social and emotional intelligence. A balance between abstraction, personal engagement, and reflexively purposive action in a specific context (Tsoukas 2005) is what we call for. An example where personal engagement and reflexivity is absent and the resultant harm is evident is computer-driven trading that relies on massive information and data sets and abstract theoretical knowledge (algorithms) without wisdom. Much of the recent financial meltdown can be understood as the triumph of uncontrolled abstract knowledge over prudence, empathy, and social intelligence (Engelbrecht 2009; Rooney et al. 2012). Clearly, a knowledge-based economy requires more than just information and knowledge. While there is no shortage of knowledge or know-how, theory, or practical experience in the world of management, it is their integration through wisdom that is scarce. Those who excel through wisdom have a clear and sophisticated sense of what is ethical and prudent, have a clearer vision of what is happening around them, have sharper insights about the future, have better and more realistic ideas, and have an enhanced capacity to translate their ideas into excellent practice. Given this situation, management for wisdom could never simply be concerned only with databases, facticity, and information, nor simply with the acquisition of ‘stocks’ of knowledge or even abstract predictive power; rather, it is about responsible, prudent, wise advice giving, decision-making, leadership, and ultimately action, when and as required. IS professionals need to provide wise leadership to bring about the changes that are necessary. IS is well placed within many organisations to adopt an executive, mediating, integrating, leadership, and advisory role. Beyond managing flows of data, IT and communications infrastructure, and so on, IS can expand its service provision in ways that resemble KM practices that manage communities of practice, that negotiate with information users to bring wise intellectual and ethical discipline to the application of information in the conduct of business. While information still matters, perhaps more than ever, the age of information-based thinking is passing. Even knowledge is not sufficient on its own when change is inevitable, fast-paced, and unpredictable. Using the recent high profile, consequence-laden case of the financial crises, we have shown that there are many problems associated with the unwise and poorly integrated collection and use of data, information, and knowledge, and argue that wisdom, particularly in its capacity for integration, judgement, prudence and ethics was lacking. Responding to Walsham’s (2012) call to expand the IS discipline’s intellectual base and to answer the question, how can IS make the world a better place, we finish by proposing that wisdom in general and Social Practice Wisdom in particular may provide a potentially effective way of enhancing IS theory and practice in three significant ways: increased ontological rigour, wisdom-informed IS research and design, and academic role modelling. IS theory is strengthened as a wisdom perspective brings more ontological rigor by explicitly incorporating environmental context and IS practice. This may include developing theories that explicitly address, for example socio-technical issues such as knowing how, why and when to either adapt to the environment or to try and change it. To do so, it becomes clearer that wisdom needs to be developed in IS professionals and the users of data, information, and knowledge. Wisdom points at reality and incorporates normative evaluation and judgment into acquiring, developing, and implementing data, information, and knowledge in designing organisational strategies and making managerial decisions. Ideally, CIOs, as wise managers and organisational leaders and cognisant of the tenets of SPW, will understand the wider ramifications of IS systems in corporate strategy, decision making, user experience, and other issues associated with using organisational IS and attempt to design and implement systems that work toward organizational and social excellence. It also follows that including wisdom theory in IS research and practice can also help to facilitate organisational wisdom. The collection and analysis of data and information could be informed by wisdom theory allowing for more openness to new ideas, experiences and critique to the values, culture and politics of the larger environment. The case demonstrates that it is often the data/information that is absent which is critically important, so information systems that facilitate the ability to mindfully, adroitly and constructively reason and understand uncertainty and situated relativities would be particularly useful. Wisdom theory also balances intuitive process with rational thinking. Wisdom-based research and design could, for example, incorporate human equanimity, perceptions and intuition alongside rationality in decision making and in developing Decision Support Systems. The development of such systems could incorporate a set of wise parameters such as ethical considerations, corporate social responsibility, long-term considerations, social impact, etc. Finally, IS academics as role models for students are not only responsible for transferring information and knowledge to students, they should enhance students’ normative and judgmental abilities in relation to designing, developing, and implementing information technologies and systems. Developing technical abilities to adopt appropriate technology and implement innovative solutions, we argue, need to be accompanied by nurturing the understanding that it is essential to consider the ethical appropriateness of information systems. In the classroom, fostering an understanding of the interests of society should be considered alongside developing organisational competiveness. Teaching and learning IS knowledge will be more likely to lead to wise outcomes when both teachers and students bear in mind the ultimate causes and consequences of the development and implementation of IS. For this, wise teachers are required (Hakim, 2006). The packed Silicon Valley-based Wisdom 2.0 events and the fully-booked mindfulness classes offered by Google would more than suggest the time is ripe for change. In the end, more and more information, more and more knowledge, and more and more expertise have proven to be insufficient to deal with the problems the world faces today. Our best hope is to entrench wisdom as a social practice in individuals and organizations, and to the greatest extent possible embed this wisdom into our information systems, designers, analysts, academics, and students. The integration of mind, knowledge, and ethics in praxis to produce a better world is surely a challenge that we cannot ignore. It is certainly the case that with a renewed interest in wisdom research after centuries of neglect we are getting to the point where we can develop wisdom in people better than we have done. A small change towards being wise in all our graduates and seasoned practitioners is likely to yield benefits beyond the sum of their parts. Ardelt, Monika. “How Similar are Wise Men and Women? A Comparison Across Two Age Cohorts.” Research in Human Development 6, no. 1 (2009): 9-26. Baltes, Paul B. “The Two Faces of Wisdom: Wisdom as a General Theory of Knowledge and Judgment about Excellence in Mind and Virtue vs. Wisdom as Everyday Realization in People and Products.” Human Development 47 no. 5 (2004): 290-299. Baltes, Paul B. and Ute Kunzmann. “Wisdom.” The Psychologist 16, no. 3 (2003): 131-133. Baltes, Paul. B. and Ursula M. Staudinger. “A Metaheuristic (Pragmatic) to Orchestrate Mind and Virtue Towards Excellence.” American Psychologist 55, no. 1 (2000): 122-136. Bangen, Katherine J., Thomas W. Meeks and Dilip V. Jeste. “Defining and Assessing Wisdom: A Review of the Literature.” The American Journal of Geriatric Psychiatry 21, no. 12 (2013): 1254–1266. Bierly, Paul E. III, Eric H. Kessler and Edward W. Christensen, “Organizational Learning, Knowledge and Wisdom.” Journal of Organizational Change Management 13, no. 6 (2000): 595–618. Brown, Scott C. and Jeffrey A. Greene. “The Wisdom Development Scale: Translating the Conceptual to the Concrete.” Journal of College Student Development 47, no. 1 (2006): 1-19. Chen, Hsinchun, Roger H. L. Chiang and Veda C. Storey. “Business Intelligence and Analytics: From Big Data to Big Impact.” MIS Quarterly 36, no. 4 (2012): 1165–1188. Curnow, Trevor. “Sophia and Phronesis: Past, Present, and Future.” Research in Human Development 8, no. 2 (2011): 95-108. Daning Hu, J. Leon Zhao, Zhimin Hua and Michael C. S. Wong. “Network-Based Modeling and Analysis of Systemic Risk in Banking Systems.” MIS Quarterly 36, no. 4 (2012), 1269–1291. Danisch, Robert. “Risk Assessment as Rhetorical Practice: The Ironic Mathematics behind Terrorism, Banking, and Public Policy.” Public Understanding of Science 22, no. 2 (2011): 236–251. Dalal, Nikunj. “Wisdom Networks: Towards a Wisdom-Based Society.” In The Open Knowledge Society: A Computer Science and Information Systems Manifesto, edited by Miltiadis D. Lytras, John M. Carroll, Ernesto Damiani, Robert D. Tennyson, David Avison, Gottfried Vossen, Patricia Ordóñez de Pablos, 11-18. New York Springer, 2008. Davenport, Thomas H. “Competing on Analytics.” Harvard Business Review 84, no. 1 (2006): 98-107. Davies, Islay, Peter Green, Michael Rosemann, Marta Indulska and Stan Gallo. “How Do Practitioners Use Conceptual Modeling in Practice?” Data & Knowledge Engineering 58, no. 3 (2006), 358–380. Davison, Robert M. and Damon Drummond. “The Ethics of IT Professionals in Japan and China.” Journal of the Association for Information Systems 10, no. 11 (2009), 834-859. Engelbrecht, Hans Jürgen. “Pathological Knowledge-Based Economies: Towards a Knowledge-Based Economy Perspective on the Current Crisis.” Prometheus 27, no. 4 (2009): 403 – 414. Financial Crisis Inquiry Commission (FCIC). “The Financial Crisis Inquiry Report: Final Report of the National Commission on the Causes of the Financial and Economic Crisis in the United States.” Washington D.C., Financial Crisis Inquiry Commission, 2011. Gärtner, Christian. “Wisdom in the Flesh: Embodied Social Practices of Wisdom in Organizations.” Philosophy of Management 10, no. 1 (2011): 29-42. Gibson, Paul S. “Developing Practical Management Wisdom.” Journal of Management Development 27, no. 5 (2008): 528-536. Glück, Judith, Susanne König, Katja Naschenweng, Uwe Redzanowski, Lara Dorner, Irene Straßer, and Wolfgang Wiedermann. “How to Measure Wisdom: Content, Reliability, and Validity of Five Measures.” Frontiers in Psychology 4, 12 July (2013): 405. Gygax, Max and Stephen P. Fitzgerald. “Enriching the Positive Organizational Behavior Framework with Wisdom.” International Journal of Business Research 11, no. 2 (2011): 23-41. Hakim, Albert B. Historical Introduction to Philosophy, 5th ed. Upper Saddle River, NJ: Pearson, 2006. Hirschheim, Rudy and Heinz K. Klein. “Realizing Emancipatory Principles in Information Systems Development: The Case for ETHICS.” Management Information Systems Quarterly 18, no. 1 (1994): 83-109. Holcombe, Randall G. “Firms as Knowledge Repositories.” The Review of Austrian Economics 26, no. 3 (2013): 259-275. Hutchinson, Douglas S. The Virtues of Aristotle. London and New York: Routledge and Kegan Paul, 1986. Intezari, Ali and David J. Pauleen. “Management Wisdom in Perspective: Are You Virtuous Enough to Succeed in Volatile Times?” Journal of Business Ethics, 120, no. 3 (2014): 393–404. Intezari, Ali and David J. Pauleen. “Students of Wisdom: An Integral Meta-Competencies Theory of Practical Wisdom.” In A Handbook of Practical Wisdom: Leadership, Organization and Integral Business Practice, edited by Wendelin Küpers and David J Pauleen, 155-174. Surrey, UK: Gower, 2013. Intezari, Ali and David J. Pauleen. “When Knowledge is Insufficient: Wisdom in a Complex World.” Paper presented at the American Conference of Information Systems, Seattle, August 9-11, 2012. Jones, Rachel, Jim Corner and Raimo Hämäläinen. “Systems Intelligence as a Lens for Mangeming Personal Knowledge.” In Personal Knowledge Management: Individual, Organizational and Social Perspectives, edited by David J. Pauleen and Gary Gorman, 70-98. Surrey, UK: Gower, 2011. Kramer, Deirdre A.“Conceptualizing Wisdom: The Rrimacy of Affect-Cognition Relations.” In Wisdom: Its Nature, Origins, and Development, edited by Robert J. Sternberg, 279-313. New York: Cambridge University Press, New York, 1990. Kuhn, Timothy and Steven R. Corman. “The Emergence of Homogeneity and Heterogeneity in Knowledge Structures During a Planned Organizational Change.” Communication Monographs 70, no. 3 (2003): 198-229. Lemann, Nicholas. “Street Cop.” The New Yorker 89, no. 36 (2013): 41-44. Liew, Anthony. “DIKIW: Data, Information, Knowledge, Intelligence, Wisdom and their Interrelationships.” Business Management Dynamics 2, no. 10 (2013): 49-62. Mansell, Robin. “The Life and Times of the Information Society.” Prometheus 28, no. 2 (2010): 165-186. Marglin, Stephen A. The Dismal Science: How Thinking Like an Economist Undermines Community. Cambridge: Harvard University Press, 2008. Mason, Richard O. “Four Ethical Issues of the Information Age.” MIS Quarterly 10, no. 1 (1986): 5-13. Mayo, Anthony J. and Nitin Nohria. In Their Time: The Greatest Business Leaders of the Twentieth Century. Boston: Harvard Business School Press, 2005. McDonald, Paul. “Maoism Versus Confucianism: Ideological Influences on Chinese Business Leaders.” Journal of Management Development 30, no. 7/8 (2011): 632-646. Molteni, Mario and Matteo Pedrini. “In Search of Socio-Economic Syntheses.” Journal of Management Development 29, no. 7/8 (2010): 626-636. Myers Michael D. and Heinz K. Klein. “A Set of Principles for Conducting Critical Research in Information Systems.” Management Information Systems Quarterly 35, no 1 (2011): 17-36. Norgaard, Richard B. Development Betrayed: The End of Progress and a Coevolutionary Revisioning of the Future. London: Routledge, 1995. Nunamaker, Jay F. Jr., Nicholas C. Romano Jr., Robert Owen Briggs. “Increasing Intellectual Bandwith: Generating Value from Intellectual Capital with Information Technology.” Group Decision and Negotiation 11, no. 2 (2002): 69-86. Opdebeeck, Hendrik and André Habisch. “Compassion: Chinese and Western Perspectives on Practical Wisdom in Management. Journal of Management Development, 30, no. 7/8 (2011): 778-788. Pape, Leo and Arthur Kok. “Real-World Limits to Algorithmic Intelligence.” Artificial General Intelligence Lecture Notes in Computer Science, 6830 (2011): 394-400. Rooney, David. “Knowledge, Economy, Technology and Society: The Politics of Discourse.” Telematics and Informatics 22, no. 3 (2005): 405-422. Rooney, David. “Empirical Wisdom Research: A Community Approach.” In Wise Management in Organisational Complexity, edited by Mike J. Thompson, David Bevan, 34-52. Palgrave Macmillan, London, 2013a. Rooney, David. “Grounding Organizational Wisdom Theory: Ontology, Epistemology, and Methodology.” In A Handbook of Practical Wisdom: Leadership, Organization and Integral Business Practice, edited by Wendelin Küpers and David Pauleen, 79-98. Gower, London, 2013b. Rooney, David, Tom Mandeville and Tim Kastelle. “Abstract Knowledge and Reified Financial Innovation: Building Wisdom and Ethics into Financial Innovation Networks.” Journal of Business Ethics 118, no. 3 (2012): 447-459. Rooney, David, Bernard McKenna and James R. Barker. “History of Ideas in Management Communication Quarterly.” Management Communication Quarterly 25, no. 4 (2011): 583-611. Rooney, David, Bernard McKenna, Peter Liesch. Wisdom and Management in the Knowledge Economy. New York: Routledge, 2010. Rooney, David, Neil Paulsen, Victor J. Callan, Madeleine Brabant and Cindy Gallois. “A New Role for Place Identity in Managing Organizational Change.” Management Communication Quarterly 24, no. 1 (2009): 44-73. Rowley, Jennifer. “The Wisdom Hierarchy: Representations of the DIKW Hierarchy.” Journal of Information Science 33, no. 2 (2007): 163-180. Rowley, Jennifer and Frances Slack. “Conceptions of Wisdom.” Journal of Information Science 35, no. 1 (2009): 110-119. Sawyer, Steve, Marie Griffiths, Ben Light and Sian Lincoln. “Guest Editorial: Constructing, Deconstructing and Negotiating the Boundaries of Digital Cultures.” Information Technology & People 24, no. 1 (2011): 5-9. Schwartz, Barry and Kenneth. Sharpe. Practical Wisdom: The Right Way to Do the Right Thing. London: Penguin, 2010. Smith, Andrew E. and Michael S. Humphreys. “Evaluation of Unsupervised Semantic Mapping of Natural Language with Leximancer Concept Mapping.” Behavior Research Methods 38, no. 2 (2006): 262-279. Spence, Edward H. “Information, Knowledge and Wisdom: Groundwork for the Normative Evaluation of Digital Information and its Relation to the Good Life.” Ethics and Information Technology 13, no. 3 (2011): 261-275. Spiller, Chellie, Edwina Pio, Lijijana Erakovic, Manuka Henare. “Wise Up: Creating Organizational Wisdom Through an Ethic of Kaitiakitanga.” Journal of Business Ethics 104, no. 2 (2011), 223–235. Staudingera, Ursula M. “A Psychology of Wisdom: History and Recent Developments.” Research in Human Development 5, no. 2 (2008): 107-120. Staudingera, Ursula M. and Monisha Pasupathi. “Correlates of Wisdom-Related Performance in Adolescence and Adulthood: Age-Graded ‘Paths’ Toward Desirable Development.” Journal of Research on Adolescence 13, no. 3 (2003): 239-268. Sternberg, Robert J. “Understanding Wisdom.” In Wisdom: Its Nature, Origins and Development, edited by Robert J. Sternberg, 3-9. Cambridge, UK: Cambridge University Press, 1990. Sternberg, Robert J. “A Balance Theory of Wisdom.” Review of General Psychology 2, no. 4 (1998): 347-365. Sternberg, Robert J. Wisdom, Intelligence and Creativity Synthesized. Cambridge, UK: Cambridge University Press, 2003. Sternberg, Robert J. “Why Smart People Can be So Foolish.” European Psychologist, 9 no. 3 (2004): 145-150. Vandergriff, Linda J. “Welcome to the Intelligence Age: An Examination of Intelligence as a Complex Venture Emergent Behavior.” VINE: The Journal of Information and Knowledge Management Systems 38, no. 4 (2008): 432-444. Walsham, Geoff. “Are We Making a Better World with ICT’s: Reflections on a Future Agenda for the IS Field.” Journal of Information Techology 27, no. 2 (2012): 87-93. Watson, Marcus, Andrew Smith and Scott Watter. “Leximancer Concept Mapping of Patient Case Studies.” Computer Science 3683 (2005): 1232-1238. Yang, Shih-ying. “Real-Life Contextual Manifestations of Wisdom.” The International Journal of Aging and Human Development 67, no. 4 (2008): 273-303. Yang, Shih-ying. “East Meets West: Cross-Cultural Perspectives on Wisdom and Adult Education.” New Directions for Adult and Continuing Education 131 (2011): 45-54. The astute reader will not fail to see the irony of using algorithmic software in this study. Well noted! However, the case is that although we use it as a tool, we also read wider literature, think, reflect, and discuss the data set extensively. Moreover the result is critically peer reviewed. These are significant differences from the way algorithmic software is being used in the business world.